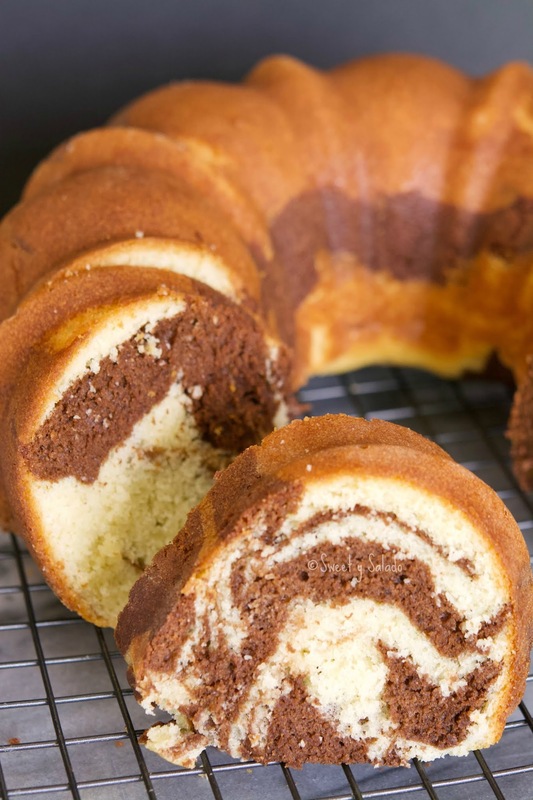 This marble cake is the perfect combination for those people who, like me, love both vanilla and chocolate. And not only that, once you divide the batter you can choose how much to make of each flavor. I personally like to divide it into equal parts because I don’t have a favorite. I usually make the batter with cocoa powder because I love that rich chocolate flavor that you get from it but you can also make it by melting about 5-6 ounces of semi sweet chocolate in the microwave and adding it to the batter. Either way works really well. And to get that perfect marble look the best way is to make several layers of both flavors and then stir everything with a chopstick, wooden skewer or knife. Previously I used to make just one layer of each flavor but then I noticed that making this cake with more than one layer of batter makes it come out way better. 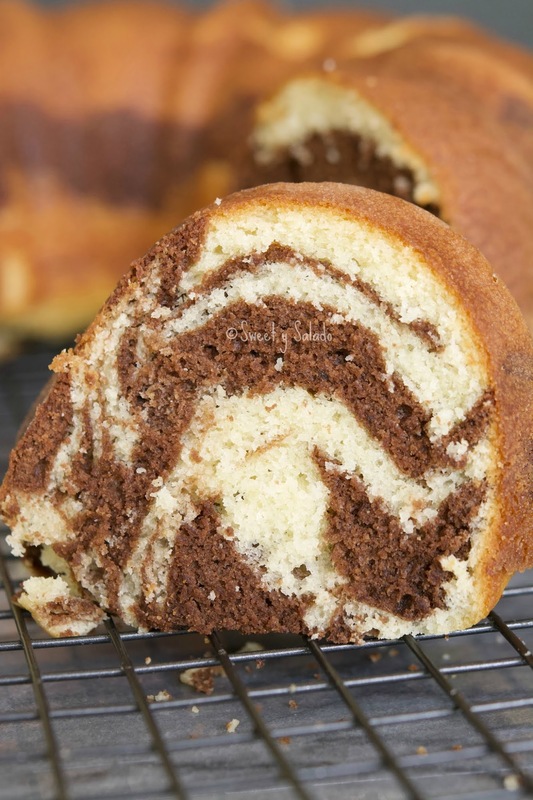 And if at the end the marbling in your cake doesn’t come out too perfect, it really doesn’t matter because the flavor is still going to be delicious. Pre-heat oven at 350°F (180°C). In a medium bowl sift the flour, baking powder and salt. Set aside. In a large bowl beat the butter, oil and sugar until it’s all soft and creamy. Now add one egg at a time and add the vanilla extract along with the last egg. Add the flour mixture in 3 batches alternating with the amount of milk, which will be added in 2 batches. Begin and end with the flour mixture. Mix only until each ingredient is incorporated without over mixing, otherwise, you will end up with a tough cake. Make sure to scrape the bowl well to make sure everything has been incorporated. Divide the batter into two separate bowls however you want. If you want it to be half vanilla and half chocolate, divide it into equal parts. If you want it to be more vanilla than chocolate then pour about 1/3 of batter into a separate bowl to make it into chocolate, etc.. Add the cocoa powder into the batter that will be the chocolate cake and stir until it is incorporated. 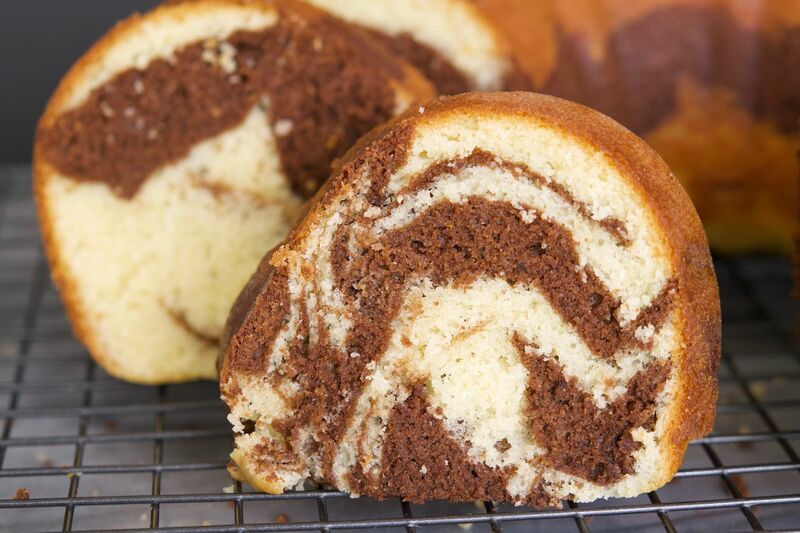 Pour each batter into a prepared large Bundt pan alternating between each flavor. I use a spoon to make a thin layer of each. 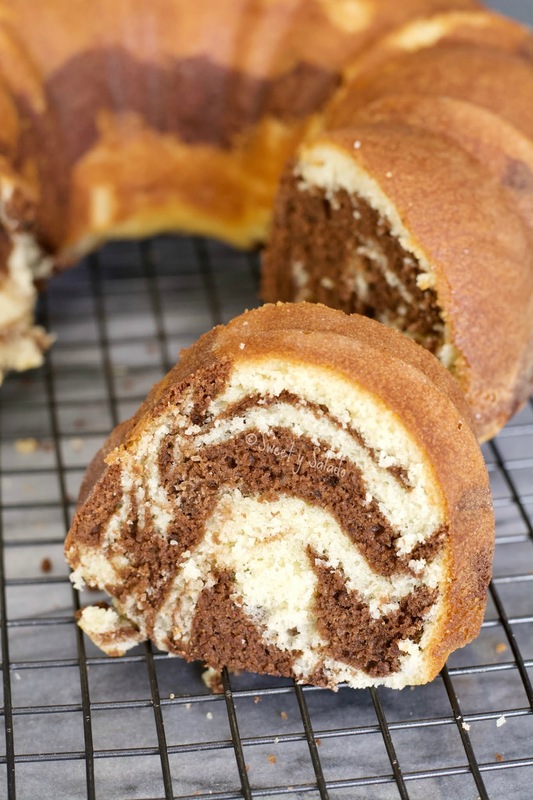 Then, with a chopstick, wooden skewer or knife gently swirl the batter to get that marble look. Bake for about 35-40 minutes or until a toothpick or knife inserted in the center comes out clean. Take the cake out of the oven and let it rest on a cooling rack for about 10 minutes. Then take it out of the pan and let it cool completely. You can also melt about 5-6 ounces of semi sweet chocolate in the microwave or in a double boiler and use this mixture for the chocolate cake instead of the cocoa powder.